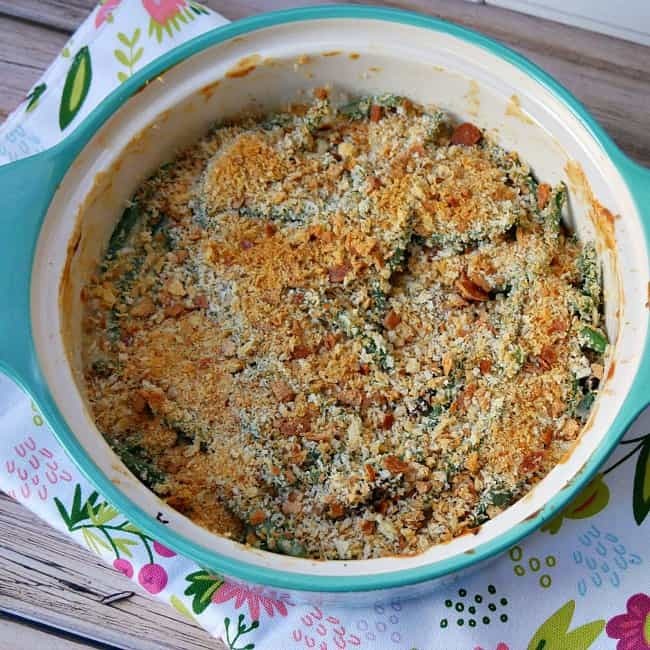 Skip the cans and make homemade green bean casserole recipe from scratch using fresh green beans! One of my husband's favorite side dishes for Thanksgiving is green bean casserole. He loves it so much that I often make to serve when we have a roast chicken for dinner. I have always made the “traditional” green bean casserole with canned beans, canned soup and fried onions from – a can. But I've always wanted to make fresh homemade green bean casserole from scratch. I knew it had to be better. And it is! This does take a little more time and work to make, but it is so worth it. This recipe stars fresh green beans rather than canned or frozen beans. Make sure to clean up the beans and snap off the ends first. I just line them up on a cutting board and cut off the ends. It's faster. Once the beans are prepped, they need to be cooked until crisp tender before they can go in the casserole. I just boiled mine for a few minutes until they turned bright green and would bend without snapping. You could microwave them, too or use any method you prefer. Once they are cooked, set them aside. In addition to green beans, I added fresh onion, sliced baby bella mushrooms and garlic. I sauteed it all up in a skillet with some butter. Olive oil would be good, too. In place of the canned soups, this recipe uses a basic white sauce that's seasoned with dry dressing mix and pepper. You can use any store bought dress mixing like a Ranch dressing. I used homemade Italian dressing mix. The sauce is easy to make. Just make sure to go slow and whisk out all the clumps before adding more milk to the flour/butter roux. 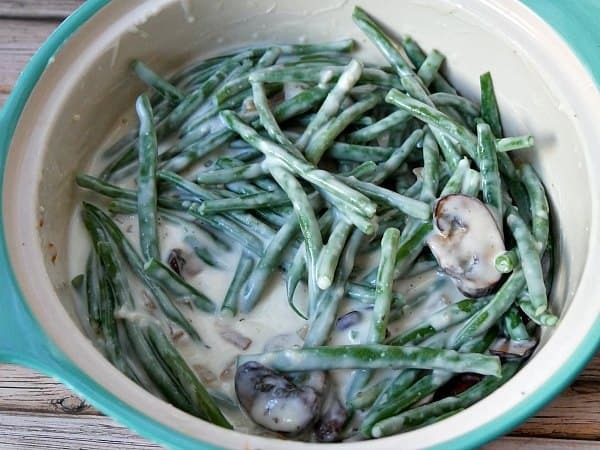 Mix together the sauce, mushroom mixture and green beans in a 1 1/2 quart baking dish or casserole dish. Instead of canned fried onions, top the casserole with fresh homemade bread crumbs. You'll need a food processor to make these. A blender may even work. I love my food processor, though. It's definitely a worthwhile investment if you like to cook from scratch. If you don't have one, just use store bought bread crumbs – or the onions! To make fresh bread crumbs, process 1-2 slices of bread in a food processor. I don't even dry it out. I just toss it right in the food processor and pulse. Spread the crumbs on a baking sheet and toast lightly. Mix together the bread crumbs with the reserved mushroom mixture. Sprinkle it over the casserole. Bake uncovered about 20-30 minutes or until heated through. To make the bread crumbs: process 1-2 slices of bread in a food processor. Spread on a baking sheet and toast lightly. 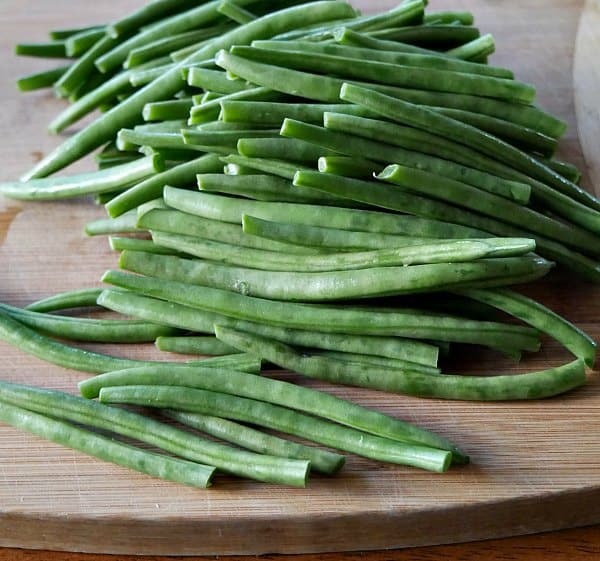 To cook the green beans: Boil a pot of water big enough to fit the green beans. Add the green beans to the boiling water and cook until the beans are bright green and bend a little, but aren't too soft. Melt butter in a small pan over low heat. Whisk in the flour and continue to whisk and cook for about 2 minutes. The mix will be a dry consistency. Slowly whisk in the milk, a little at a time, to the flour and butter mix. Go slow and whisk out all the lumps before adding more milk. Once all the milk has been added, bring the mixture to a boil over low heat, whisking constantly. Allow to thicken. This should take 1-2 minutes once it boils. Remove from heat was thickened and stir in dressing mix and pepper. Set aside. Pre-heat oven to 350 degrees. Heat a medium skillet over medium high heat. Melt 1 Tablespoon butter. Add onion and cook until translucent. Add in garlic and cook for another minute. Remove half the mixture in to a bowl and set aside. 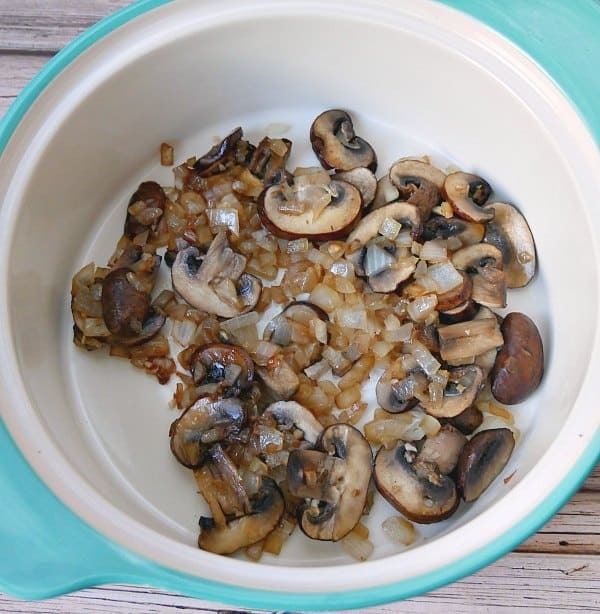 Add sliced mushrooms to the remaining onion mix in the skillet. Cook until the mushrooms release their moisture, about 5 minutes. Remove from heat. Put the mushroom mixture from the skillet in to a 1 1/2 quart baking dish. Add green beans and white sauce. Stir to combine and coat the green beans with the sauce. Mix together the bread crumbs with the reserved mushroom mixture. Sprinkle it over the casserole. Bake uncovered about 20-30 minutes or until heated through. 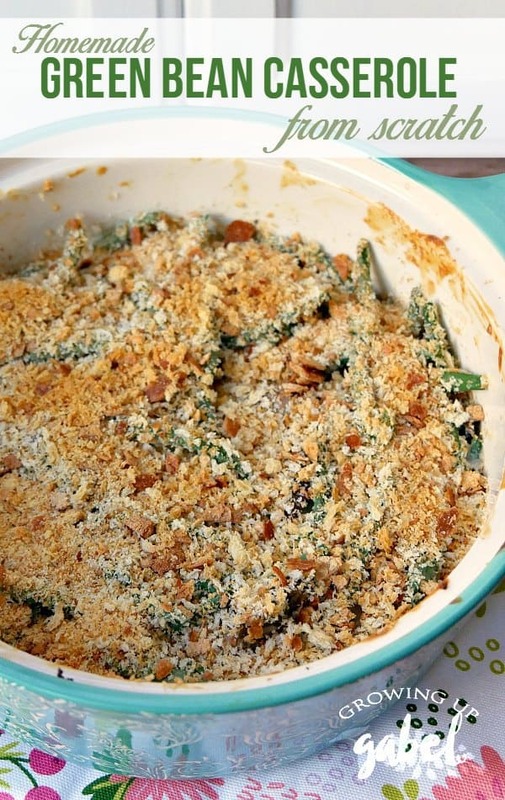 This will be a great Green Bean Casserole, perfect for the holiday! Wishing you a bountiful Thanksgiving and thanks so much for sharing with us at Full Plate Thursday. I like the freshness of this recipe – Thanks for sharing at the What’s for Dinner party! 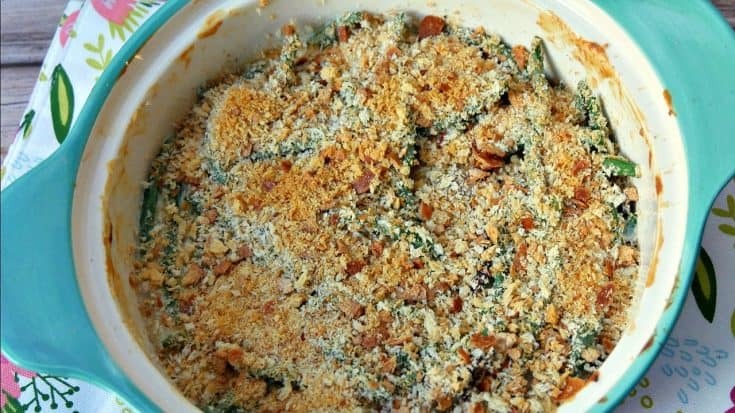 Finally a green bean casserole worth making! Thanks for sharing with us at Throwback Thursday. Pinned and shared! Looks good. Thanks for sharing on the What’s for Dinner link up and don’t forget to leave a comment at the party – Next week’s features that also leave a comment get pinned, yummed and tweeted!